Johann Wolfgang von Goethe (1749-1832) is considered the most important German poet and head of the literary era of German classical music. He was an all-rounder, because he dealt scientifically with botany, anatomy, zoology, mineralogy, meteorology, optics and color theory and he was last but not least also a wine expert. Goethe has given the wine and the women in short form the following monument: "A girl and a glass of wine, alleviate all hardship, and who does not kiss and who does not drink, who is long dead!" Wine and wine culture has in his Life played a big role. His grandfather Friedrich Georg Göthe (1657-1730) was the owner of the renowned inn "Zum Weidenhof" and built up an extensive wine shop. His father Johann Caspar Goethe (1710-1782) had the extensive wine cellar of the Goethe birthplace in the "Grosse Hirschgraben" in Frankfurt am Main Goethe later stored and regularly supplemented his extensive collection. According to tradition, it is also due to the wine that he survived the difficult birth. When the child was born after three days of labor, it was without signs of life, discolored blue-black and threatened to suffocate. The baby was then bathed by the midwife in an Arden (wooden trough) with warm wine, so he "pecked the heart pit" (massaged) and ultimately saved his life. 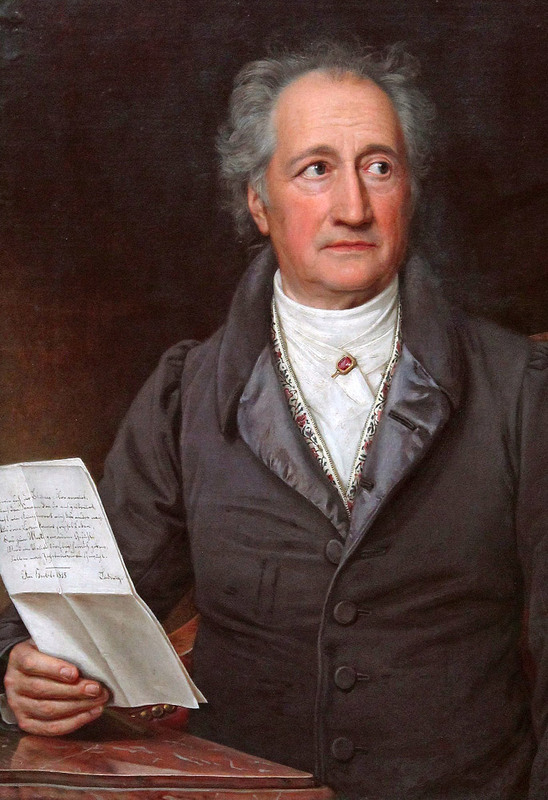 Since early youth, Goethe regularly drank wine and that also explains that he was very well-tolerated and hardly ever got drunk (in a letter of 16.10.1767 - at the age of 18 - he writes however "that he was drunk as a beast " ). Excessive drinking with (then customary) subsequent smashing of glasses but he refused. Preferred wine was Frankenwein (Riesling) from its nearer home Franconia which he also best tolerated and enjoyed a lighter-caliber lunch at noon. To his absolute favorite wine counted a Würzburger stone, but also wines from the still famous single layers Hochheim and Castle Johannisberg, For a 30-day spa stay in Carlsbad in 1820, he took a barrel Würzburger (volume of 80 Bouteillen). According to invoices still received, he regularly received wine from all over Europe from a total of 40 wine merchants from the cities of Frankfurt, Worms, Erfurt and Reims. These include Tokajer, Egerer, Ofner (Hungary), Melniker (Czech Republic), Lacrima Christi (Italy), Malaga, Tinto de Rota (dessert wine from Spain), Champagne, Graves, Alsatian, Languedoc, Burgundy (France) and Ruster (Austria). The friend of him Friedrich von Schiller (1759-1805) ordered about him at the Erfurt dealer Ramann Wein and was also advised by Goethe or listened to his recommendations. In a letter to the wine merchant Ramann dated 2.5.1816 he ordered "half a bucket of Würzburger and half a bucket of Alsatian, because filling the missing gaps in my wine storage, this time more need than ever" (a bucket was at that time about 60 liters ). The year 1811 with the famous one often mentioned in the literature 1811er was (especially in Germany) a very good one vintage, Goethe often raved about the "Eilfer", which he sent by letter to the famous winery Bassermann-Jordan ordered. From a banquet in the house of the poet Clemens Brentano (1778-1842) is reported: "From the good Rhine wines he could drink a terrible amount, especially from the penalty" . Goethe especially preferred wine; beer he rarely drank because he did not tolerate it. His wife Christiane shared the passion for wine with him. In many of his letters and writings are always the themes of wine, viticulture and wine enjoyment. He was also very interested in the art of winemaking and the phenology of the vine and made over it many remaining drawings. Goethe was obviously inspired by wine enjoyment for his immortal works. In this context, he remarked: "Others are sleeping off their intoxication, with me he is on paper!" And in a letter of 25.1.1781 he wrote: "Last night I drank a bottle of champagne and helped the literature." In the Persian poet and Korangelehren Mohammed Shams ed-Din, vulgo Hafiz (1324-1390), Goethe found a kindred twin soul over the centuries and cultures that loved and wrote many verses, just as he loved wine and women. By the way, his poems inspired him to write his most extensive collection of poems "West-Eastern Divan". Goethe criticized (as did Hafis) the Islamic alcohol ban and wrote about the Persian poet in exuberant words: "They have called you holy Hafiz, the mystic tongue, and have not recognized the word-scholars, the value of the word. You call them mystical because they think something foolish with you, and give away their unfair wine in your name. But you are mystically pure, because they do not understand you, that you are blessed without being pious! They do not want to concede that to you. " From Goethe are many verses and Quotes received over the wine and the wine enjoyment. During a visit to Lake Zurich, he wrote in his travel diary on June 15, 1775: "Without wine we can never be three hundred on earth. Without wine and without women, the devil will bring our bodies ". Another verse reads: "First of all, people learn to drink, and much later eat, so in gratitude they should not forget to drink!" Goethe was also a connoisseur of wine, of which a story is told at dinner, to which the Grand Duke Carl August (1757-1828). A red wine was served and guests were asked about the origin. Only Goethe gave the correct answer: "He is unknown to me, but I believe that it is a Jenenser (from Jena) who has lain for some time in Madeira." He also kept a lot of wine culture. Opposite to a man who diluted his wine with water, he unwillingly remarked, "Where did you learn this evil custom?" This page was last modified at 18 August 2018 at 07:30.